OTTAWA - A federal official is distancing the Conservative government from Jason Kenney's public musings over the weekend that spending cuts might be required to balance the budget. In a series of interviews, the employment minister said the government would have to entertain budget cuts, such as extending its operational spending freeze, in order to stay in surplus territory as planned for this fiscal year. He also said the government would not dip into its $3-billion contingency reserve, which it sets aside for unexpected circumstances. But a senior official, speaking on condition of anonymity, says there are no budget cuts in the works. The official — who wasn't authorized to discuss the matter on the record — also hinted that the contingency reserve is indeed in play, given the unforeseen nature of the recent plunge in oil prices. Kenney is the chairman of the cabinet committee on operations, but he has not been part of all the pre-budget discussions and decision-making. "We have no cuts planned," said the official. "The contingency fund is there for unforeseen circumstances." That's in line with the recent messaging from Finance Minister Joe Oliver. He announced last week that the federal budget would not be tabled until April at the earliest so that the government could get a better grip on the effect of dramatically lower oil prices and a sudden scale-back in capital expenditures in the oilpatch. Oliver has also suggested that the government may need some of the $3-billion cushion in order to ensure the budget is balanced. 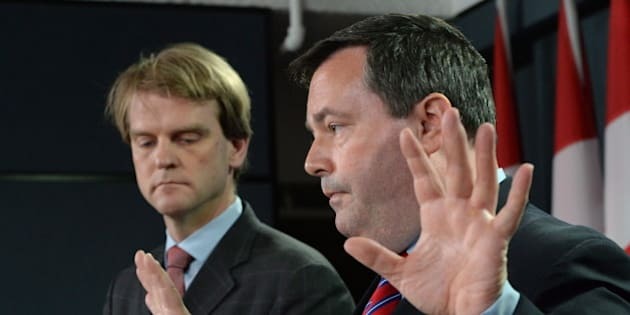 On the weekend, Kenney described the contingency reserve as out of bounds in that regard, and suggested the government would rather cut spending than dip into its rainy-day fund. "We'll have to certainly look at potentially continued spending restraint," Kenney said on CTV's "Question Period," which aired Sunday. "For example, we’ve had an operating spending freeze. The finance minister may have to look at extending that." And on Global's "The West Block," Kenney said: "We won't be using a contingency fund. A contingency fund is there for unforeseen circumstances, like natural disasters." Officials in Kenney's office did not immediately respond to a request for comment. Many experts believe low oil prices will challenge the Harper government to live up to its long-standing promise to balance Canada's books in 2015-16 — a pledge that's considered central to Conservative fortunes in the 2015 election, currently scheduled for October. The government has repeatedly maintained it would eliminate the deficit, even with dramatically lower crude oil prices cutting — indirectly, but significantly — into federal revenues. Ottawa's latest budget projection for 2015-16, announced in November, called for a $1.6-billion surplus. At the time, Oliver warned that plummeting oil prices could carve $2.5 billion a year out of federal coffers between 2015 and 2019. Since then, the price of oil has fallen even further, from about US$80 per barrel to below US$50. Much of that acceleration came after Prime Minister Stephen Harper announced a controversial multibillion-dollar suite of Conservative family tax and benefit measures, including the oft-maligned plan to allow income splitting for eligible couples with children. The entire package, including an enriched child care benefit and greater deductions for child care expenses, is expected to reduce federal coffers by $4.6 billion in 2015-16 and a total of $27 billion over six years. One day after announcing the plan to delay the budget, Oliver was asked if — in hindsight — he regretted the timing of the government's new tax and benefit package. "Well, we weren't in the midst of a 50 per cent slide in the oil prices," he responded. "But the point is, a surplus isn't there to look at. A surplus is there to provide benefits to Canadians."